An enduring classic, Caprese Salad offers tempting variations on its combination of mozzarella, ripe tomatoes, and fresh basil. Begging for creamy avocado and fresh herbs, this twist on tradition is perfect for everyday meals and parties. These cherry tomatoes are tiny, about 1/2-inch (1.25-cm) diameter. 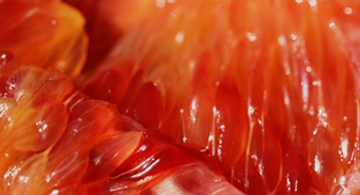 Coyotes are pale yellow-green, Yellow Currants are intensely sunny-orange, and Red Mexicans are so sweet. Don't let their diminuitive size fool you; these are tiny powerhouses of flavor! 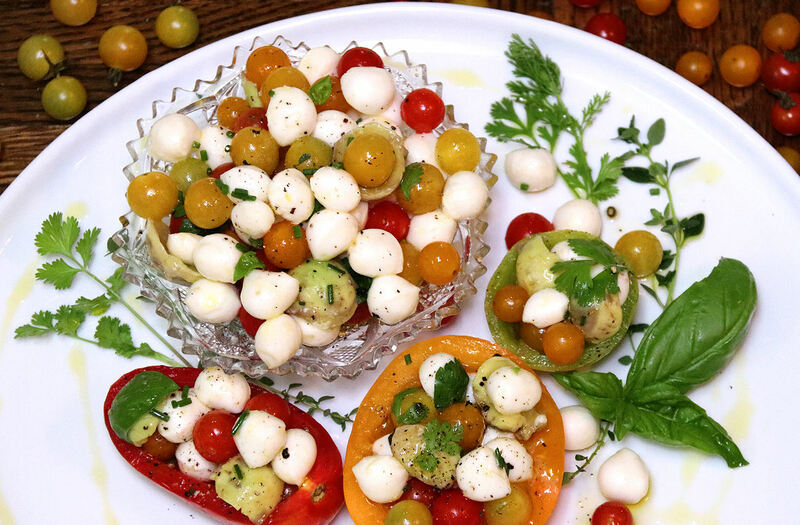 Pair mozzarella with tomatoes according to size, small pearls or perline with these tiny beauties, and little mouthfuls or bites known as bocconcini with standard cherry tomatoes. 4 servings as a salad or appetizer or 2 main course servings. Put the drained Mozzarella and tomatoes in a large bowl. 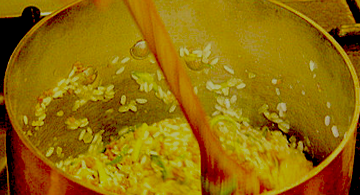 Drizzle olive oil over and toss well. Split the avocado in half, remove the seed. 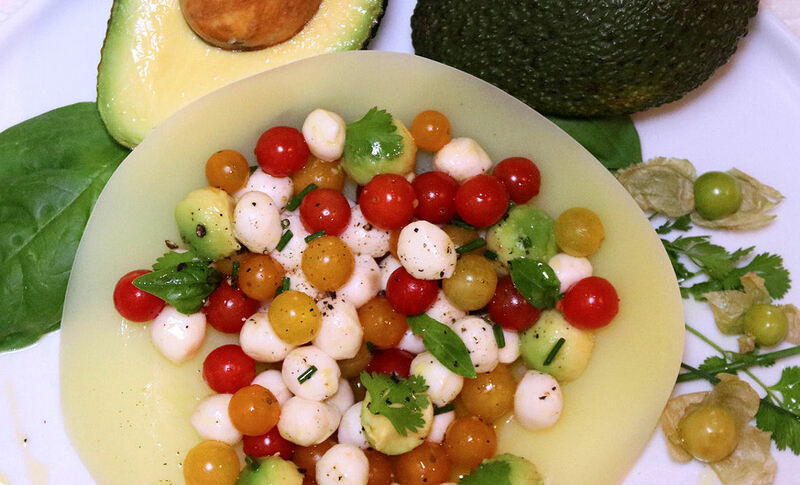 Using a very small spoon or melon ball scoop, shape the avocado into small balls. With each scoop, immediately place the avocado in the lemon or lime juice to prevent discoloration. When finished, scoop out the avocado balls with a perforated spoon to drain off excess juice. Add the avocado to the bowl. Season with salt and pepper to taste. Gently toss the ingredients coating thoroughly. Sprinkle fresh herbs on top. Serve Caprese Salad in tomato cups or individual salad bowls.